Have you seen this dining room by designed by Miles Redd?! It's part of an amazing home featured in House Beautiful's April issue. Where do I begin on describing my love for this space?! 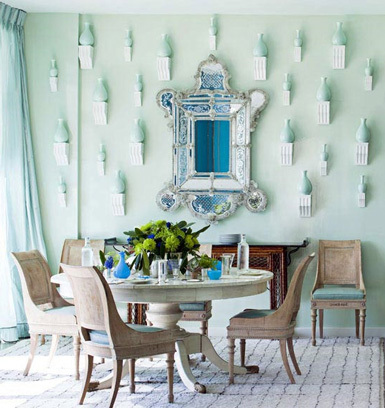 For starters, how stunning is that wall display of celadon vases mounted on plaster brackets? The matching vase and wall color keep the display from overwhelming the space and the white brackets provide just enough contrast. The monochromatic color palette is fresh and soothing - I could see myself spending hours in this room! And I love the bleached midcentury dining chairs paired with the ivory dining table. What do you think about this space? Would you try a wall display as dramatic as this one? Wow! I love Miles Red, but this room takes the cake! I loved this space in HB. Such a gorgeous color. Would definitely try this out. What a great idea!